Ajanta Caves in Maharashtra, India are a Buddhist monastery complex of twenty-nine rock-cut cave monuments containing paintings and sculpture considered to be masterpieces of both "Buddhist religious art" and "universal pictorial art" The caves are located just outside the village of Ajinṭhā in Aurangabad District in the Indian state of Maharashtra (N. lat. 20 deg. 30' by E. long. 75 deg. 40'). Since 1983, the Ajanta Caves have been a UNESCO World Heritage Site. Excavation of the caves began in the third-second century B.C.E., during the period when Dakshinapath was ruled by Satavahana dynasty, and activity at the complex continued until the fifth to sixth century C.E., when the region was ruled by Vakatakas. Both the Satavahanas and Vakatakas were followers of Brahmanism, but also patronized the Buddhist shrines. The walls, ceilings and columns of the caves were covered with complex compositions of the Jataka stories (the stories of the Buddha's former existences as Boddhisattva), and ornate floral and animal decorations. The exuberance and richness of the painting suggests that the artists were accustomed to painting secular as well as religious works. The paintings have a natural fluidity, depth and volume not found in later, more stylized Indian art. The Ajanta Caves are a Buddhist monastery complex consisting of 29 caves (as officially numbered by the Archaeological Survey of India), located in a wooded and rugged horseshoe-shaped ravine about 3.5 km from the village of Ajintha, which is situated in the Aurangābād district of Maharashtra State in India (106 kilometers away from the city of Aurangabad). Along the bottom of the ravine runs the Waghur River, a mountain stream. The caves, carved into the south side of the precipitous scarp made by the cutting of the ravine, vary from 35 to 110 feet in elevation above the bed of the stream. The monastic complex of Ajanta consists of several viharas (monastic halls of residence) and chaitya-grihas (stupa monument halls), adorned with architectural details, sculptures and paintings that, even in their partially damaged state, are considered one of the glories of world art. Excavation of the caves began in the third-second century B.C.E., during the period when Dakshinapath was ruled by Satavahana dynasty, and activity at the complex continued until the fifth to the sixth century C.E., when the region was ruled by Vakatakas. Both the Satavahanas and Vakatakas were followers of Brahmanism; nevertheless, they not only generated a liberal climate in which all religions could flourish, but also patronized the Buddhist shrines. The mention of a rock-cut monastery as the abode of the Buddhist monk Achala celebrated Buddhist philosopher and author of well-known books on logic, and the mountain range where it was located, the monastery being for certain Cave No. 26 and the mountain range, Ajanta ridge, appeared in the travel account of the Chinese pilgrim Hiuen Tsang, who visited India in the seventh century C.E. and stayed there for 15 years. Nothing more was known of Ajanta before 1819, when some British officers of the Madras Army made a chance discovery of this magnificent site. They named it Ajanta after the name of the nearest village. In 1843, after a gap of 25 years, James Fergusson presented a paper to the Royal Asiatic Society of Great Britain and Ireland and drew global attention to the site. The Madras Army deputed its officer R. Gill to prepare copies of the Ajanta murals. Gill worked from 1849 to 1855 and prepared 30 paintings, but unfortunately they were destroyed in a fire in 1866. The efforts to discover Ajanta progressed in two directions, the preparation of copies of the murals, and research on Ajanta's other aspects. Mr. Griffiths, the Superintendent and Principal of Sir Jamshedji Jijibhai School of Art, Bombay, was at Ajanta from 1872 to 1885 with a team of his students, to copy its murals, but unfortunately most of these were also destroyed in a fire. Finally, Lady Haringham and a team of artists comprising Syed Ahmad and Mohammad Fazlud-din of Hyderabad and Nandalal Bose, Asit Kumar Haldar and Samarendranath Gupta of the Calcutta School, camped at Ajanta from 1910 to 1912 copying its murals. In 1956-1957 the Archeological Survey of India took up the project and authentic copies of the murals were prepared. 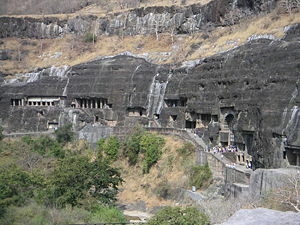 In 1983, the Ajanta Caves were declared a UNESCO World Heritage Site. 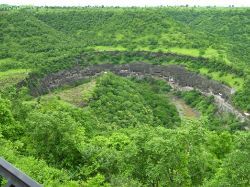 The period during which Ajanta Caves were excavated stretches over eight- or nine hundred years from the third- to second century B.C.E. to the fifth- sixth century C.E. The caves reveal two distinct phases of excavation. Six of them, namely, caves 9, 10, 8, 12, 13, and 15-A (the last one was re-discovered in 1956, and is still not officially numbered), belong to the early period. Caves 9 and 10 appear to have been excavated during the second half of the third or the first half of the second century B.C.E.. The other four date from the first century B.C.E. However, Cave 10 is the earliest; it precedes even Cave 9 by at least 50 years. Caves 12, 13, and 15A of this phase are vihāras (monastic halls of residence). During this period, Buddhism pursued the Hīnayāna doctrine, which initially prohibited the worship of anthropomorphic images of Buddha. Caves 9 and 10, the Chaitya-grahas (homes of the Sacred, monument halls) do not have anthropomorphic images of Buddha, though on the façade of Cave No. 9 such images were subsequently added. Around the first century B.C.E. Hinayana allowed the making of Buddha's personal images. The shift from non-image to image characterizes other caves of this early phase, known as the Hinayana-Satavahana phase. Caves 1, 2, 4, 7, 11, 14, 15, 16, 17, 18, 19, 20 to 24, 25, 26, 27, 28 and 29 belong to the later phase, which began three centuries later, from the fifth to the sixth century C.E.. Buddhism had largely shifted to Mahayana doctrine and the region was ruled by Vakatakas of the Vatsagulma branch, who were also the patrons of these caves; this phase is usually known as Mahayana-Vakataka phase. As suggested by epigraphic records, Caves No. 16 and 17 were commissioned by Vakataka ruler Harishena (475-500 C.E.) through one of his ministers Varahadeva, who was posted at the site for supervising the progress, and a subordinate vassal of the area respectively. Ajanta had been a center of monastic and religious activities since the second- to first century B.C.E. ; the embellishment of facades and wall spaces with paintings and sculptures continued all through. However, the excavation of the caves seems to have been suspended until the excavation of Caves 16 and 17. Cave 8 was long thought to be a Hinayāna cave; however current research shows that it is in fact a Mahayana cave. Three chaitya-grihas, caves 19, 26, and 29, were excavated during the Vakataka or Mahayana phase. The last cave was abandoned soon after it was begun. The rest of the excavations are viharas: caves 1-3, 5-8, 11, 14-18, 20-25, and 27-28. None of the caves in the Vakataka phase were ever fully completed. Based on the archaeological evidence visible on site, the suggestion of Walter M. Spink that a crisis occurred when the ruling Vakataka dynasty suddenly fell out of power and forced all activities to a sudden halt, is increasingly gaining acceptance. The viharas are of various sizes, the maximum being about 52 feet. They are often square-shaped. Their designs are varied; some have simple and some have ornate facades, some have a porch and others do not. The hall was an essential element of a vihara. The early viharas of the Vakataka phase were not intended to have shrines because they were meant to be used solely as halls of residence and congregation. Later, a shrine set in the back wall of the vihara became a norm. The shrines were fashion to house a central object of reverence, often the image of the Buddha seated in the dharmachakrapravartana mudra (the gesture of teaching position). In the more recent caves, subsidiary shrines are added on the side walls, porch or the front-court. The facades of many vihāras are decorated with carvings, and walls and ceilings were often covered with paintings. Most of the subjects of the paintings have been identified by the German Ajantologist, Dieter Schlingloff. The first cave on the eastern end of the horse-shoe shaped scarp, it is, according to Spink, one of the latest caves to have begun on site and brought to near-completion in the Vākāţaka phase. Although there is no epigraphic evidence, it has been proposed that the Vākāţaka king Harisena may have been the benefactor of this better-preserved cave. This cave has an elaborate carving on its facade with relief sculptures on entablature and fridges, depicting scenes from the life of the Buddha as well as a number of decorative motifs. A two-pillared portico, visible in nineteenth-century photographs, has since perished. The cave has a front-court with cells fronted by pillared vestibules on either side, and a porch with simple cells on both ends. The absence of pillared vestibules on the ends suggest that the porch was not excavated in the latest phase of Ajanta, when pillared vestibules had became the norm. Most areas of the porch were once covered with murals, of which many fragments remain. There are three doorways: a central doorway and two side doorways, and two square windows carved between the doorways to brighten the interiors. Each wall of the hall inside is nearly 40 feet long and 20 feet high. A square colonnade of 12 pillars inside supports the ceiling and creates spacious aisles along the walls. A shrine carved on the rear wall houses an impressive seated image of the Buddha, his hands in the dharmachakrapravartana mudra (position). There are four cells on each of the left, rear, and the right walls. The walls are covered with paintings in a fair state of preservation, depicting mostly didactic, devotional, and ornamental scenes from the Jataka stories (the stories of the Buddha's former existences as Boddhisattva), the life of the Gautam Buddha, and those of his veneration. Cave 2, adjacent to Cave 1, is known for the paintings that have been preserved on its walls, ceilings, and pillars. It resembles Cave 1 and is in a better state of preservation. 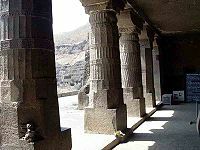 The porch and the facade carvings are different, and the cave is supported by robust ornamented pillars, but the size and ground plan have many aspects in common with the first cave. The front porch has of cells supported by pillared vestibules on both ends; porch-end cells, which provided more room, symmetry, and beauty, became a trend in all later Vakataka excavations. The paintings on the ceilings and walls of this porch have been widely published. They depict the Jataka tales that are stories of the Buddha's life in former existences as Bodhisattva. The porch's rear wall has a doorway in the center, which allows entrance to the hall. On either side of the door is a square-shaped window to brighten the interiors. Four colonnades arranged in a square support the ceiling; the capitals are carved and painted with various decorative themes that include ornamental, human, animal, vegetative and semi-divine forms. The paintings covering the walls and ceilings are eroded and fragmentary at various places. Painted narratives of the Jataka tales are depicted on the walls in such a way that a devotee walking through the aisles between the colonnades and the wall would be able to “read” about the Buddha's teachings and life through successive births. The Ajanta Cave paintings are the earliest and most important wall paintings in India and are particularly significant because all other forms of painting, such as palace murals and painting on wood, cloth or palm-leaf from before about 1000 C.E. have not survived. 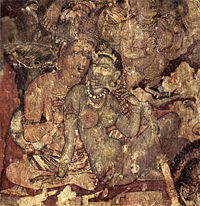 The technique and process used to create the Ajanta cave paintings are unlike any other artwork found in the art history of other civilizations, and are unique within the history of South Asian art. The walls, ceilings and columns of the caves were covered with complex compositions of the Jataka stories and ornate floral and animal decorations. The paintings depict a universe in which aristocratic men and women dwell in harmony with an abundant nature. The exuberance and richness of the painting suggests that the artists were accustomed to painting secular as well as religious works. The process of painting involved several stages. First, the rock surface was chiseled to make it rough enough to hold a plaster made of clay, hay, dung and lime over a clay under-layer. Differences are found in the ingredients and their proportions from cave to cave. While the plaster was still wet, the drawings were outlined and the colors applied. The wet plaster had the capacity to soak up the color so that the color became a part of the surface and would not peel off or decay easily. The colors were referred to as 'earth colors' or 'vegetable colors.' Various kinds of stones, minerals, and plants were used in combinations to prepare different colors. The paint brushes used to create the artwork were made from animal hair and twigs. The outline drawing has a fluency and vigor not found in later Indian painting. Modeling and highlights, as well as spatial recession are used to accentuate the volume of the figures. The latest paintings show some of the highly-stylized, flatter qualities of paintings from the succeeding centuries. Sculptures were often covered with stucco to give them a fine finish and lustrous polish. The stucco had the ingredients of lime and powdered sea-shell or conch. The latter afforded exceptional shine and smoothness. In cave upper 6, where some of it is extant, the smoothness resembles the surface of glass. ↑ Ajanta Caves: Advisory Body Evaluation, UNESCO International Council on Monuments and Sites. 1982. Retrieved September 23, 2007. ↑ P.C. Jain, and Dr. Daljeet, Ajanta: A Journey Into the Religio-Aesthetic Kingdom of Buddhist Art exoticindia.com. Retrieved September 23, 2007. Griffiths, J. 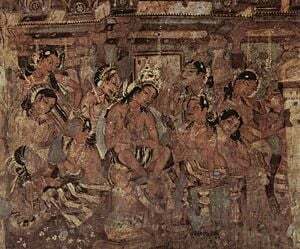 Paintings in the Buddhist Cave Temples of Ajanta. 2 vols. London: 1896 - 1897. Kramrisch, Stella. A Survey of Painting in the Deccan. Calcutta and London: The India Society in co-operation with the Dept. of Archaeology, (original 1937) Reproduced: “Ajanta,” Exploring India’s Sacred Art: Selected Writings of Stella Kramrisch, ed. Barbara Stoler Miller. Philadelphia: reprint, New Delhi: Indira Gandhi National Centre for the Arts, 1994, 273-307. Mirashi, V.V. Vakataka inscription in Cave XVI at Ajanta. Hyderabad Archaeological Series, 14. Calcutta: Baptist Mission Press for the Archaeological Department of His Highness the Nizam’s Dominions, 1941. Mitra, Debala. Ajanta, eighth ed. Delhi: Archaeological Survey of India, 1980. Nagaraju, S. Buddhist Architecture of Western India. Delhi: 1981. Yazdani, Gulam. Ajanta: the Color and Monochrome Reproductions of the Ajanta Frescoes Based on Photography, 4 vols. London: Oxford University Press, (original 1930), 1955. Yazdani, Gulam. The Early History of the Deccan, Parts 7-9. Oxford: 1960. Zin, Monika. Guide to the Ajanta Paintings, vol. 2; Devotional and Ornamental Paintings. Delhi: Munshiram Manoharlal Publishers Pvt. Ltd., 2003. This page was last modified on 13 February 2019, at 16:37.